As you research Laser eye surgery, you will most likely find yourself discovering that there are many variations of the LASIK procedure and many different kinds of technology used for Laser eye surgery. Understanding various terms and the different types of Laser procedures is essential in helping to determine which version of surgery is best for you. Many people wonder what the differences are between Traditional and Custom Wavefront. The biggest difference between the two is the technology used to assess a patient’s refractive error. For the Traditional Laser eye procedure, the patient’s prescription is measured using the same methods that would determine their prescription for glasses and contacts. The information provided from these measurements guides the doctor in reshaping the patient’s cornea. During the Custom Laser procedure, a comprehensive map of the patient’s eye is created which guides the procedure, while Traditional Laser eye surgery relies on feedback from less detailed measurements. The Traditional procedure is effective for treating lower-order aberrations such as myopia, astigmatism and hyperopia. Custom helps treat lower-order aberrations as well as higher-order aberrations such as halos, glare and starbursts. The Custom Laser procedure uses Wavefront technology which creates a print or “map” of your eye to aid the doctor in determining the most accurate prescription. The technology itself has been used by astronomers to adjust the optics of their telescopes and was adapted to measure human vision for Laser eye surgery. 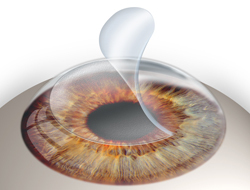 The information received from Wavefront technology assists the doctor when reshaping the patient’s cornea during the procedure. As the Custom Wavefront system shines light into your eye, the light reflects back into the system which provides the doctor with detailed information about your eye. It is often recommended that patients with severe astigmatism receive Custom LASIK to precisely measure and treat their prescription. Custom Laser eye surgery may also help people achieve improved night vision and reduce the risk of complications. For patients with a severe astigmatism, Custom is highly recommended. Please keep in mind however, not everyone requires this advanced technology to achieve their desired results in vision correction. Since our inception in 2004, we have become the Largest Laser Eye Surgery Plan Manager in the United States and currently offer more than 800 locations that specialize in refractive surgery including LASIK, Custom Wavefront LASIK and Bladeless LASIK nationwide. We are proud to be the low cost trusted Laser Vision Correction services provider for 3 out of 4 Health plans, Davis Vision, Humana, Superior Vision, Lowes, The New York Times, Barclays Capital, United Airlines and many more.